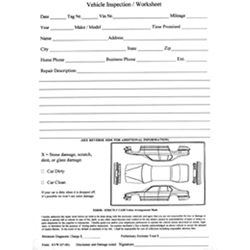 Make sure your vehicle is up to date with inspection! An excellent pre-service write-up with all the pertinent information and any vehicle damage reported. Has standard disclaimer and minimum diagnostic charge for customer to verify. This form can also be custom printed to fit your needs!